ELI has most of the functionality of the ISO APL standard, but it also has facilities not described there such as lists for non-homogeneous data, complex numbers, symbols, temporal data, control structures, scripting files, dictionaries, tables and SQL-like statements. It comes with a compiler for flat array programs. ELI is succinct, easy to learn and versatile. Compared with MATLAB or Python, ELI encourages a dataflow style of programming where the output of one operation feeds the input of another, resulting in greater productivity and clarity of code. ELI is freely available on Windows, Linux and Mac OS; See Download for versions and update information. An introductory paper, a tutorial on Programming with Arrays, ELI for Kids a novel way to learn math and coding, a Primer and a Compiler User's Guide are available in Documents. We give a sample here to illustrate the flavor of the language. 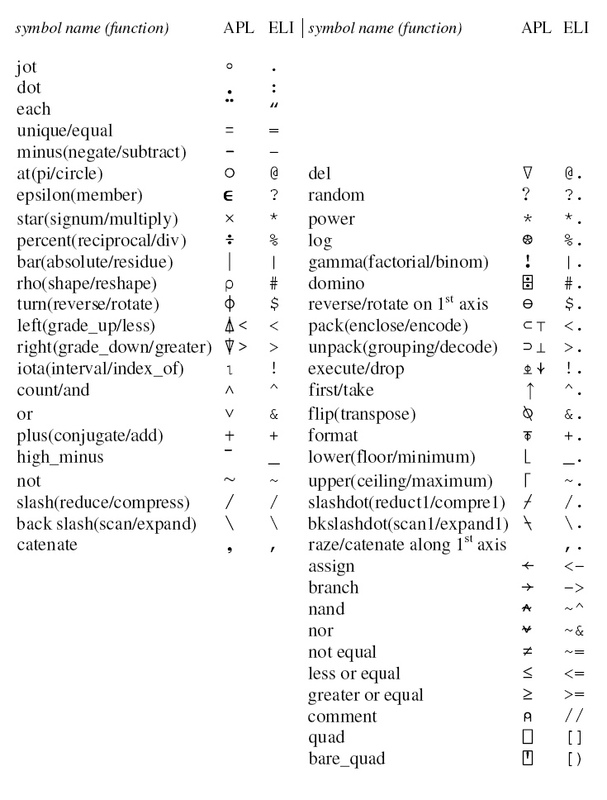 People already familiar with APL can jump directly to examine last 3 examples and the APL/ELI Symbol Comparison Table. A line of ELI executes from right to left as a chain of operations; anything to the right of // is a comment. A simple example is given to solve a coin tossing problem (pdf or iBooks) in one line of ELI. 1024*.%1 2 3 5 10     //1024 takes 1 root, square root, cube root, ..